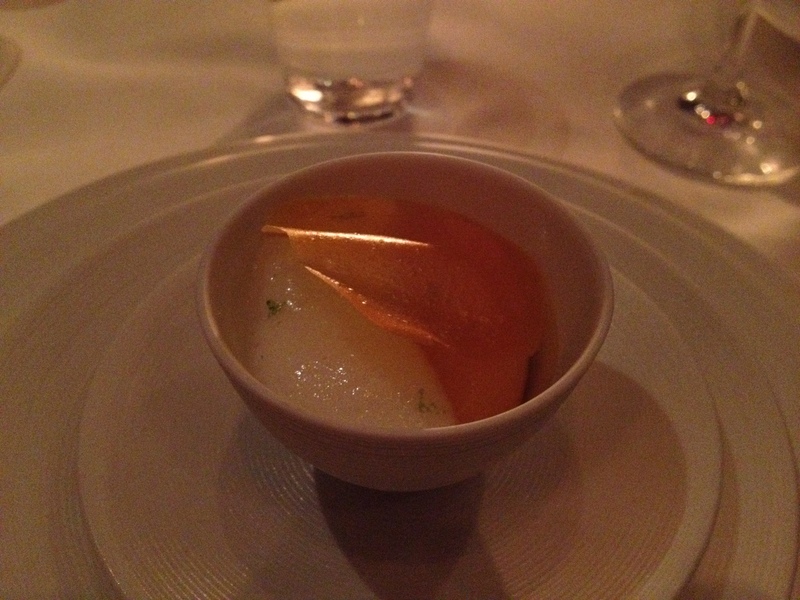 Home > Eating, New York City, North America	> NYC: Per Se (Apr. 2013 #1): Canard à la Presse! 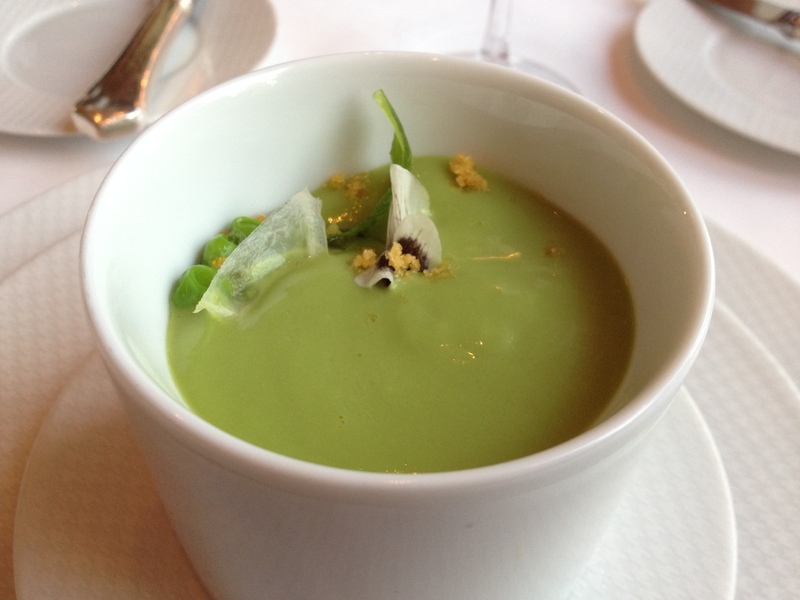 NYC: Per Se (Apr. 2013 #1): Canard à la Presse! Dinner: Mom’s Visit Meal #4! As some of you know, my mom and my cousin visited me last weekend, and I decided to show her some of my favorite fine dining restaurants in the city. This is stop #4 of 4: Per Se! This was an amazing meal, and pretty much everything was impressive. My mom, cousin, and friends had a fantastic time, and it really was a wonderful experience that I will never forget. 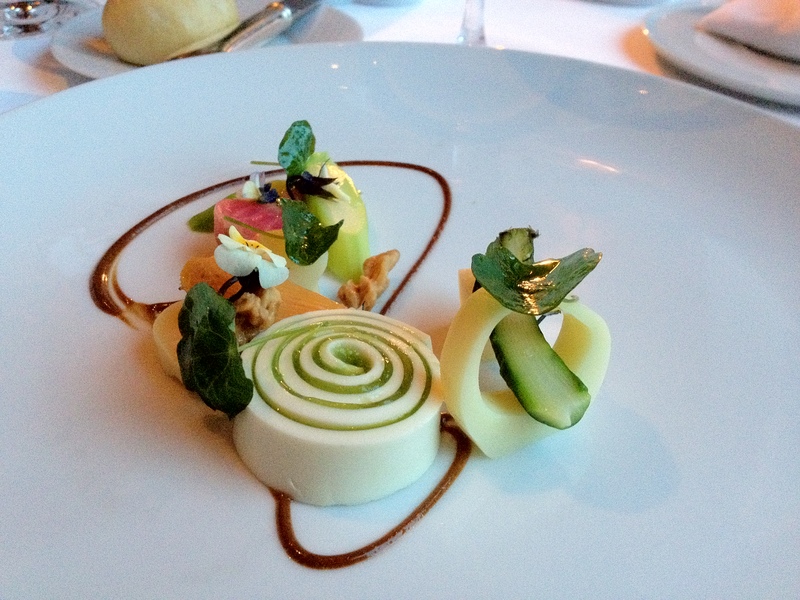 I really have to give my thanks to the staff at Per Se for making this meal possible! 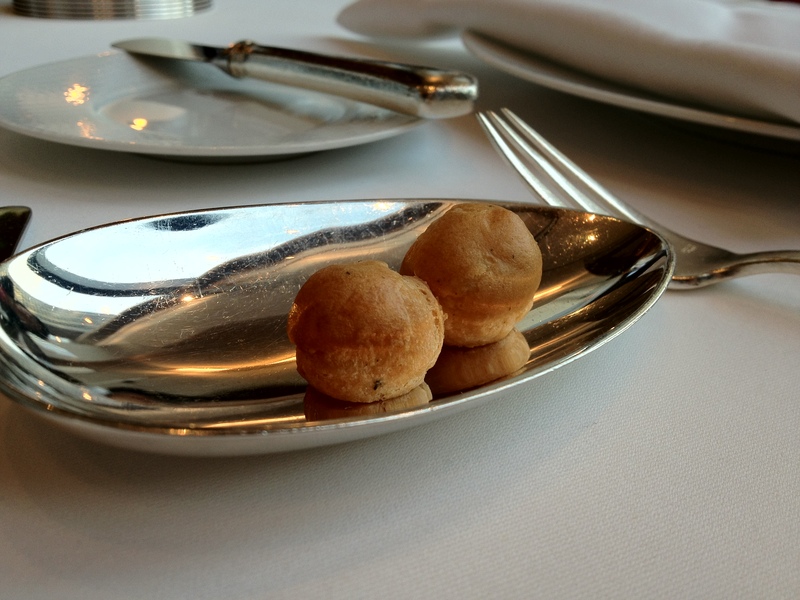 Make no mistake: Per Se is so highly lauded for very good reasons. 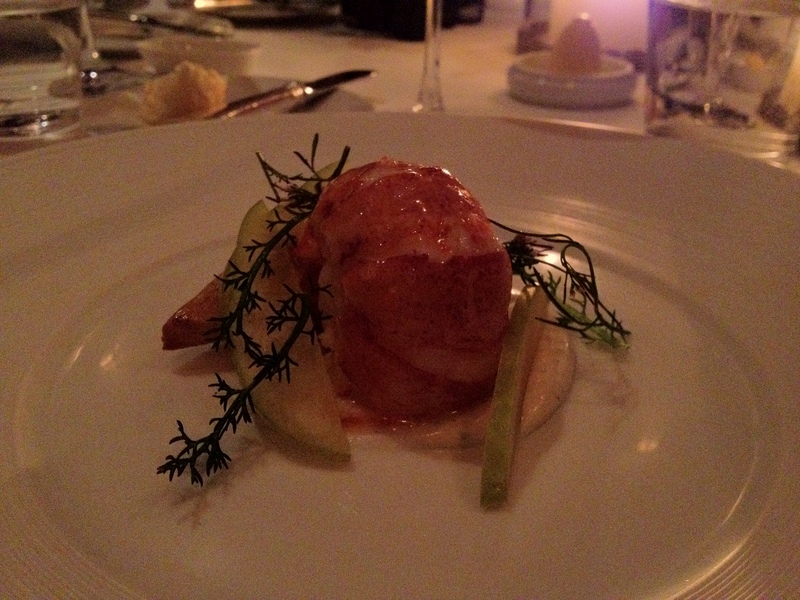 In addition to the impeccable service, the food this time reached hitherto untouched heights. 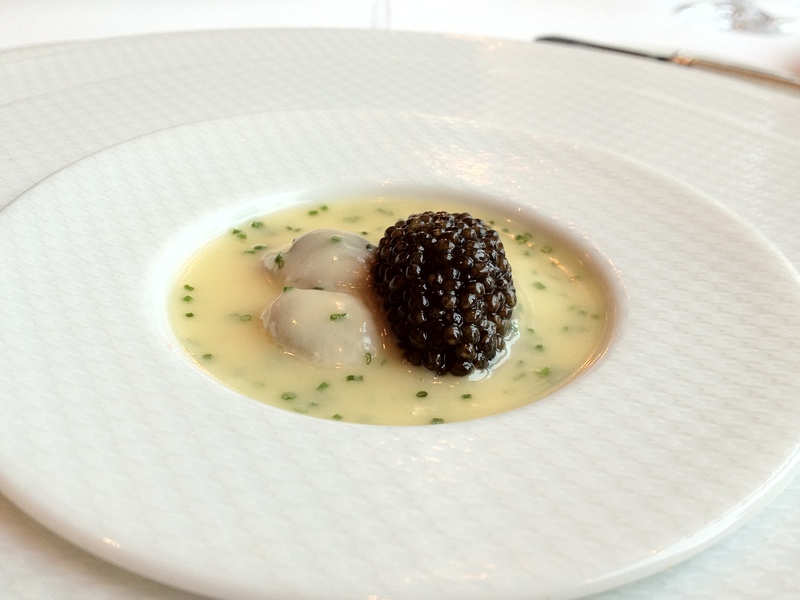 Victor and I have often discussed our favorite restaurant in New York; he loves the consistency and quality of Per Se, while I prefer the sometimes (literally) magical experience at Eleven Madison. Today, however, I can say with very little reservation that I have had the best entrees I’ve ever tasted in New York. We will gush more about these later; suffice to say that you owe it to yourself to experience this at least once in your life. At the same time, there were a couple of stumbles here today that I didn’t expect from Per Se. These were small errors that may have had more to do with my personal preferences than any actual mistake by the kitchen. They were also quickly overwhelmed by the highlights so it didn’t take away too much from the overall experience. At the same time, in the interest of fairness, they must be mentioned, so you don’t think that Victor and I are actually on the TKeller payroll. 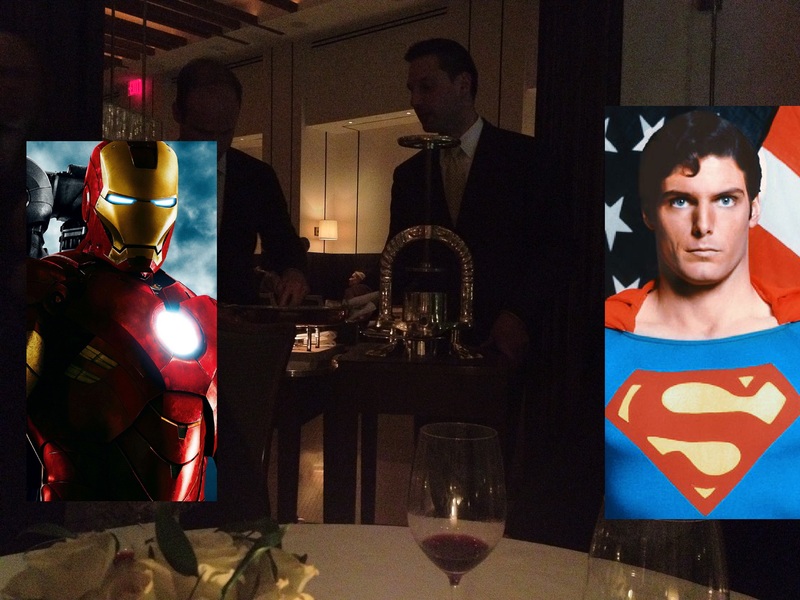 Tad: If you are reading this, you are probably either familiar with Per Se, our previous meals there, or both. So we won’t bore you with our reactions to some of the classic dishes. They were all excellent. Tad: One thing to note about this soup: it was somehow light and creamy at the same time. The little flowers were an excellent touch. Victor: You’ve probably seen a bunch of pictures of this already haha. Victor: The egg custard was amazing as usual, but the chip was a little chewier than usual. I didn’t quite like that because it took longer for me to get to the rest of the custard! Tad: So this was the first misstep of the evening. Usually the chip is very brittle, and breaks crunchily with the custard. It was chewy as Victor said, and also stuck to my teeth. Flavoring was just right though. Tad: That roll you see is creamy, flavorful, and has the texture of a well-made pudding. Quite an interesting preparation, and tastes different from the way it looks (in a good way). The only problem was that one of the hearts of palm had this weird pungency. Perhaps it’s just that I am unused to the flavor; when my home chef cooks heart of palm, it’s usually pretty mild. Anyway, I liked the rest of this dish. Tad: And here is where the meal starts getting ridiculous. 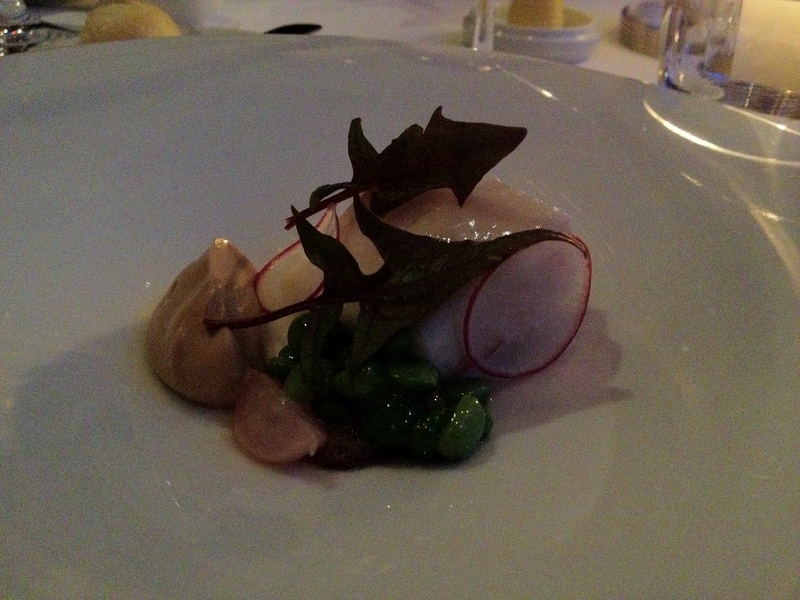 I was still half-jokingly talking about the weird tasting bit in the previous dish when this dish arrived. The mushroom pudding was amazing, reminding me almost of foie in terms of earthy richness. The sweetness of the fish helped to balance it. Eating the vegetables with the flavors of fish and mushroom pudding still in my mouth turned the whole thing into a delicious melange flavors and textures. I don’t even usually like halibut. Tad: Creamy, buttery, sweet, tart, savory. Sometimes I lament the paucity of language to describe flavor sensations. This was one of those dishes that you knew would be good even as it came out. It was not a surprise how good this dish was, but let that not detract from the exquisite technical proficiency that made the dish possible. Canard à la presse. Pressed duck. One of the most traditional and legendary French dishes. I’ve seen the duck press sitting in the Per Se salon for a few weeks now, and “canard à la presse” has been something that I’ve wanted to try for a while now. I decided to email them about a week before to inquire if it would be possible for them to do it, and, fortunately, they were willing to try it! The duck press used here was made in Paris around 1909. It used to reside in the French Laundry, but it apparently was very rarely used, and Chef Keller decided to move it to Per Se. I was really, really excited to try this dish out. Tradition calls for them to bring out a live duck and strangle it in front of you, but they didn’t do that (thankfully!). Our waiter, Chris, carved 52 chickens (from KFC!) to practice for the carving of the duck. Apparently, Chef Keller wouldn’t let him serve this course until he perfected the carving technique! So… credit goes to Chris for his excellent carving! This first pic is of my plate, while the second pic is of Tad’s. They decided to give me more for some reason (probably because they knew how excited I was to try this). I included a picture of Tad’s plate because it looks much prettier haha. At this point in the meal, I really felt that there was nowhere to go but down. How do you beat this? Tad: Victor already gave you a little bit of the back story behind this particular dish. 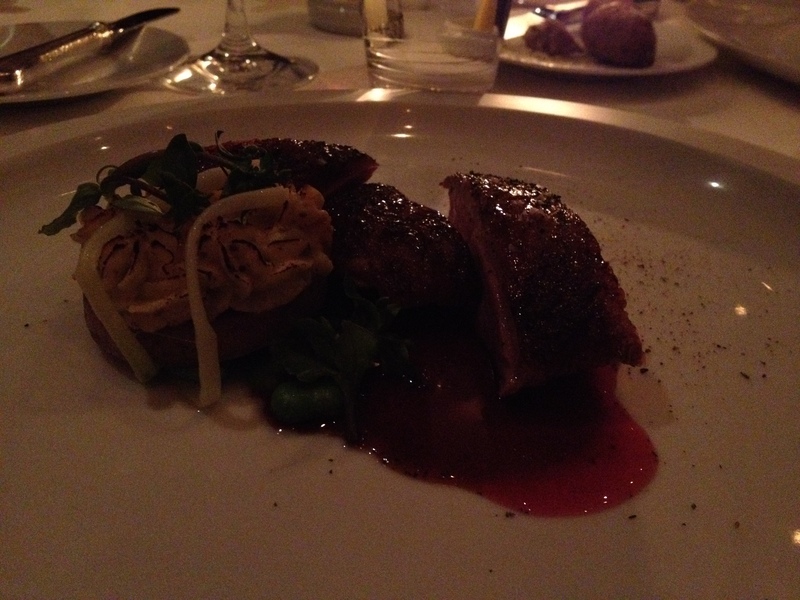 We had heard rave reviews of the canard à la presse at Daniel, which sparked our initial interest. Having it at Per Se is like a dream come true: an ultimate expression of decadent French culinary tradition at the pinnacle of a decadent French restaurants in New York. This duck did not disappoint. Once again, words fail me. The garnish was excellent in its own right. It really could have been its own dish, but no, next to the succulent, rich perfection that was the duck, all other components of that plate paled. Here is what is spectacular about the duck: the sauce. Yes, the meat was cooked perfectly. Of course, the seasoning on the duck skin was flawless. And the fat to meat ratio was just the right amount to make each bite rich but not greasy. But the sauce, dear God the sauce. Imagine a sweet, savory, thick soup that actually tastes like the essence of duck. Like you somehow created a duck in liquid form, and melted this poor fowl in butter, cognac, and whatever other tasty deliciousness came out of that kitchen. This should, of course, come as no surprise. 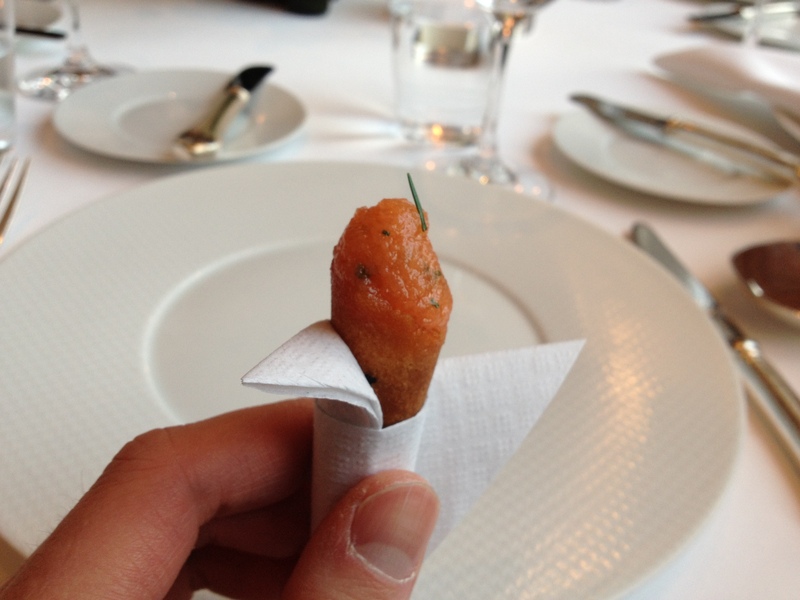 The presentation of this dish involved what seemed like a squad of six different waiters scrambling around table-side. After Chris expertly carved off the breast (I didn’t see whether the legs were used as well), it took two waiters to press the rest of the duck into a thick gravy that they then mixed into a ready saucepan. After this dish, I was done. Ready to tap out and just wait out the rest of the meal as I basked in the afterglow lingering in my mouth. 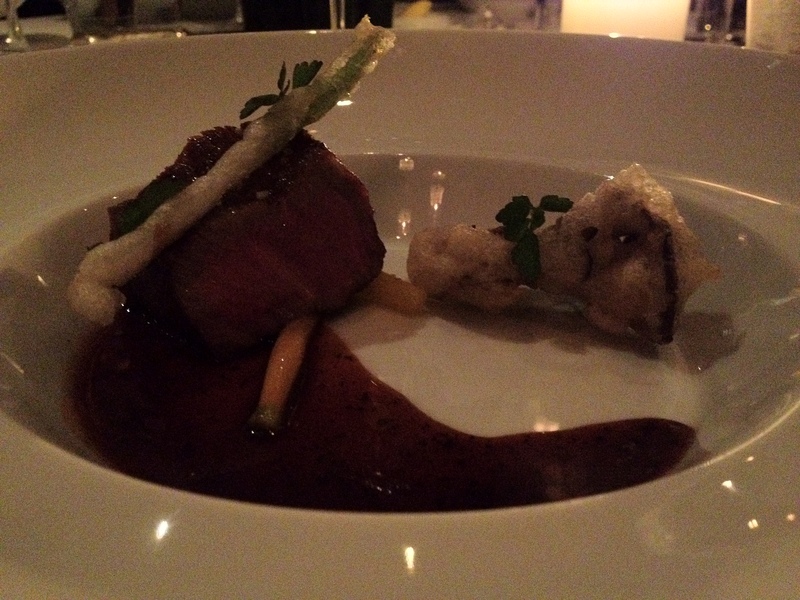 But…..
Just when I thought that they wouldn’t be able to impress me anymore, this BEAUTIFUL piece of Wagyu came out! You can’t really tell in this pic, but the meat was incredibly marbled—there was so, so much fat! This was soft, tender, and juicy. It completely melted in my mouth—it was like eating meat butter! This is definitely one of the best pieces of beef that I’ve ever had. Look, I was ready to throw in the towel (to continue the boxing analogy) after the last dish. But then this piece of meat arrived to many oohs and aahs. Even in the dim light photo, you can see the beautiful presentation, but the marbling really needs to be tasted to be believed. It’s like dating a model who also happens to run a humanitarian non-profit on the side. So yes, the meat was incredibly buttery and soft. I would describe it as having the texture of fat but the flavor of meat. It’s like eating slow-roasted pork belly without an accompanying greasiness. Unctuous but not cloying. I think part of this effect was achieved with the garnishes. The light crispiness of the tempura, combined with the fresh juiciness of the shallots and carrots added a bit of balance to what would have otherwise been an overwhelmingly rich dish. And lest you think the ingredients themselves were doing the heavy lifting, the meat was cooked and seasoned PERFECTLY, with the sauce adding just the right amount of sweetness. Tad: Another interesting course, with each element being very distinctive in its own right. Combining them in a dish so well balanced was impressive. But I was still mourning the wagyu. Caribbean Papaya, Persian Lime, and Pineapple Espuma with Bits of Coconut. Garnished with Mint. Tad: So light! So delightful! So fresh! Like actually taking a champagne shower. Tad: I thought those little nibs were white chocolate. 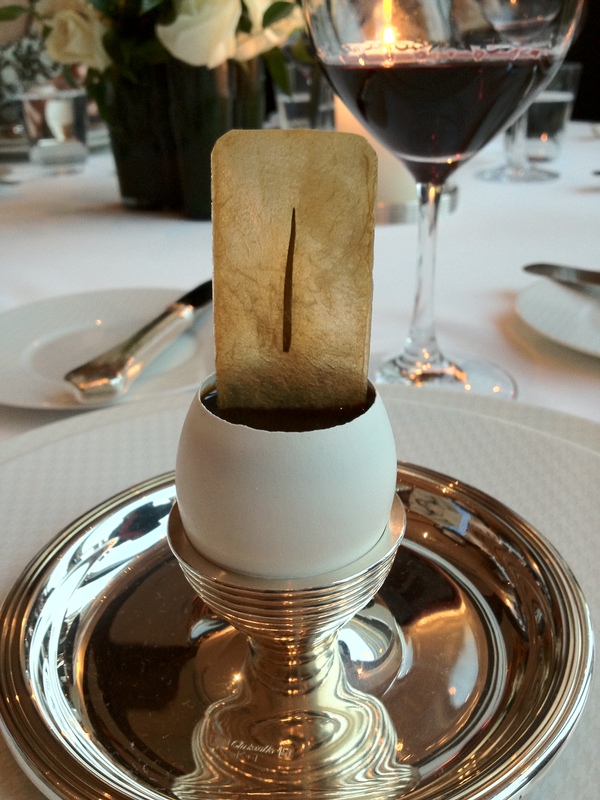 Foolish me, never so simple at Per Se. They were delightful little bites of meringue. I don’t even like meringue but it was delicious. Victor: I’m kind of surprised that they used such amazing champagne, especially for a palate cleanser. It’s really, really high-quality (and expensive) champagne haha. They were really going all-out. Here is some info on the wine, including notes from the winemaker, from wine.com! Tad: I honestly thought it was a waste of a Grande Année. Nothing discernible (at least by our lowly palates) would have been lost if they had used a slightly less prestigious label, and I would have much preferred a glass of the Grande Année by itself. Like hiring a Harvard man to do phone support. Tad: An excellent dish, but at this point, I was too full to really enjoy it. I will note that often there is a temptation to just throw a bunch of high quality chocolate preparations on a plate to serve to the customer. It would be a solid dessert, but not an excellent one. 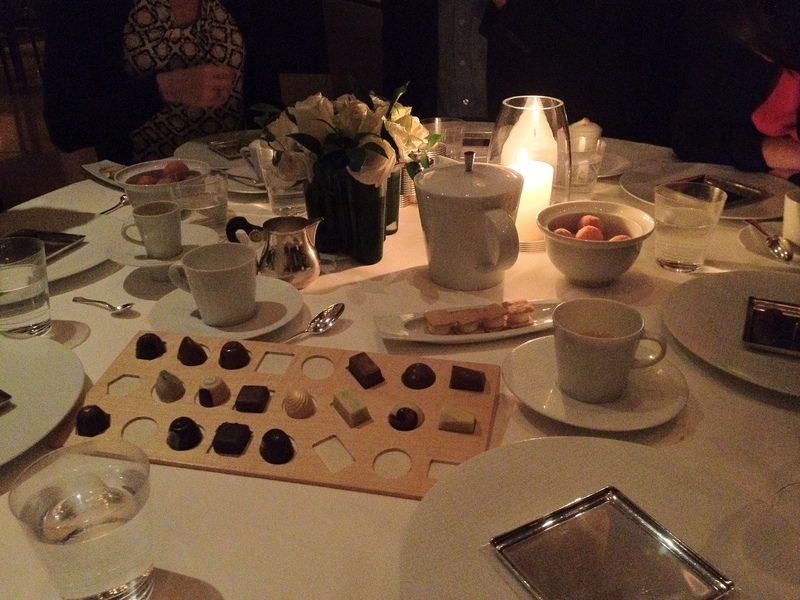 I am glad that Per Se maintains its exacting standards with this very well thought-out plate. There were so many different flavors going on here that, although the chocolate was still very much present, it did not feel like the sole pillar of the edifice. Victor: They presented our table with two boxes of 24 chocolates each, so Miles and I felt compelled to finish at least one box. We finished 9 chocolates each in less than a minute. We are such gluttons :(. Tad: Uggh…more food???! I am being tortured with pampering. Victor: We were very lucky and got to see a tour of the entire kitchen after the meal! 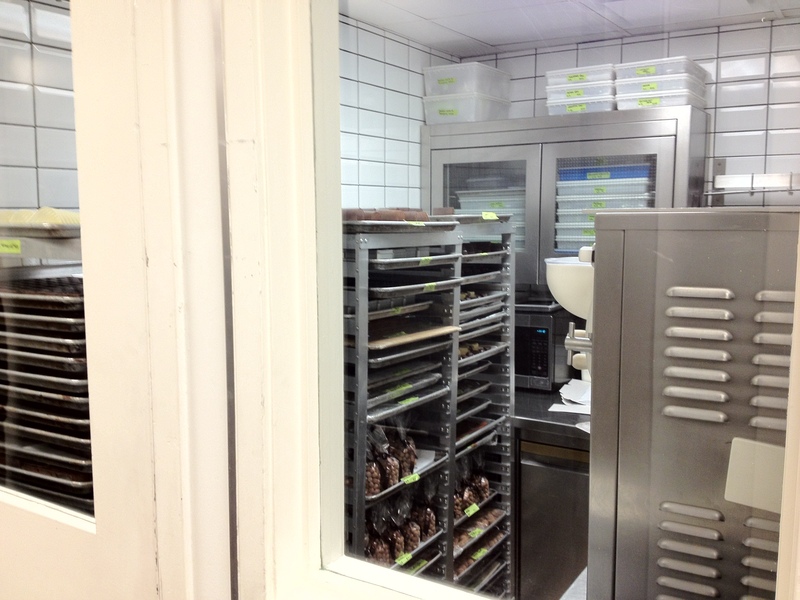 We got to see the kitchen, offices, pastry rooms for ice cream and chocolates, produce storage area, and the baking area in the back! Fantastic blog. May I ask how much the Pressed duck supplement was for you (sounds like you are fairly regular visitors)? I’ve read about the one at Daniel and last time I called a year or two back, they stopped doing it. I rather go to Per Se anyway. 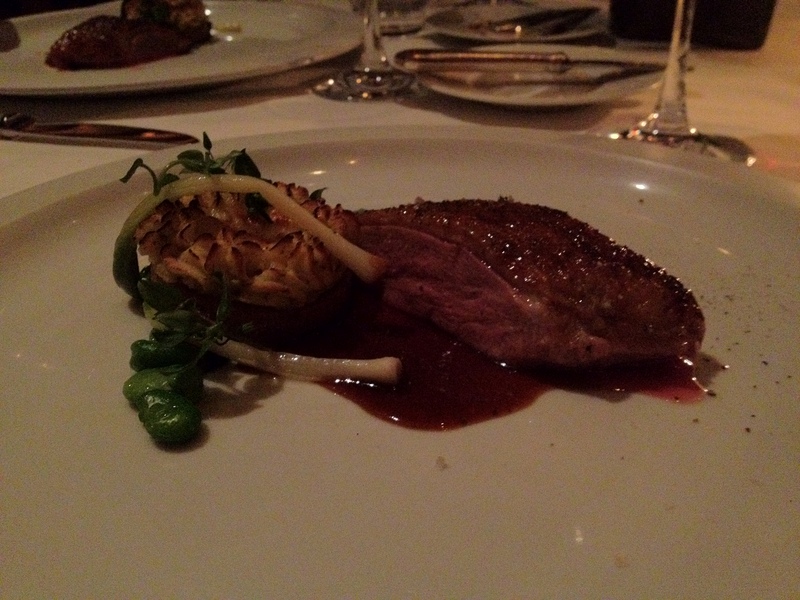 Also, how did this duck compare to EMP’s famed duck w/ lavender? Thanks. Hi, Mike! Thanks for stopping by! There wasn’t a supplement for the pressed duck. My mother was visiting NYC, so I made this reservation a few weeks in advance and asked them if they could do something with the duck press. I think it was a mix of my mother visiting being a special occasion and my request, but they decided to do this for us. I’m sure you could ask a few weeks in advance and make a special request for them to do this! Daniel stopped doing the pressed duck? I thought that they still did it. I went there a few months ago, and our waiter said that they’d be willing to do it if I called a month in advance. I actually liked this duck more than EMP’s lavender duck. EMP’s version has more delicate flavors and spices, but this was just over-the-top decadence—each piece was extremely rich, and the sauce complemented the meat perfectly (expected, of course, because the sauce DOES come from the rest of the duck!). I really like both versions, but, to me, this duck really summed up Per Se for me. Decadence, decadence, and decadence (in a good way that probably resulted in my losing a few weeks of my life—worth it!). 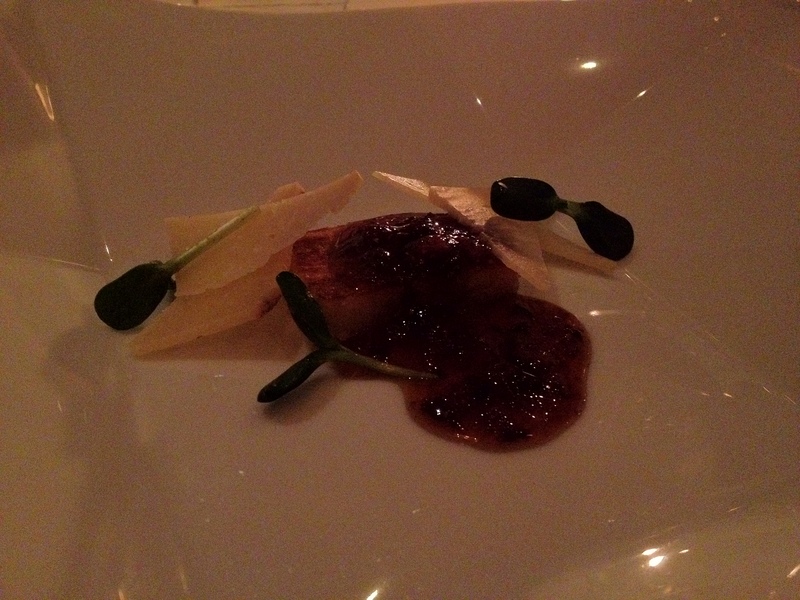 Per Se’s pressed duck is a LOT heavier than EMP’s lavender duck, though. I called Daniel probably early 2012 and they told me they stopped doing it (not sure why they would). But glad to hear they have it back. Thanks for all the intel. The pressed duck sounds even better now, if that’s possible.. Do you opt for the extended tasting menu ever? 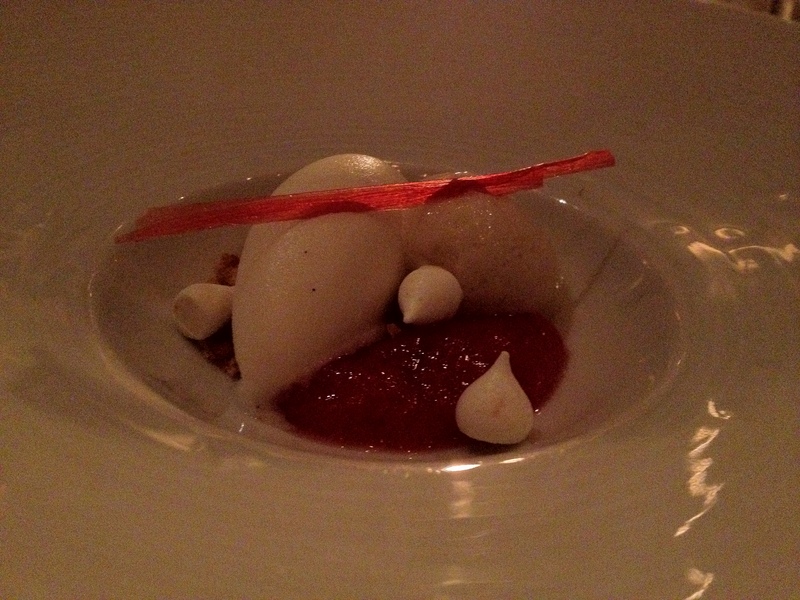 I’ve done it only at TFL, with the regular tasting at my only visit at Per Se. 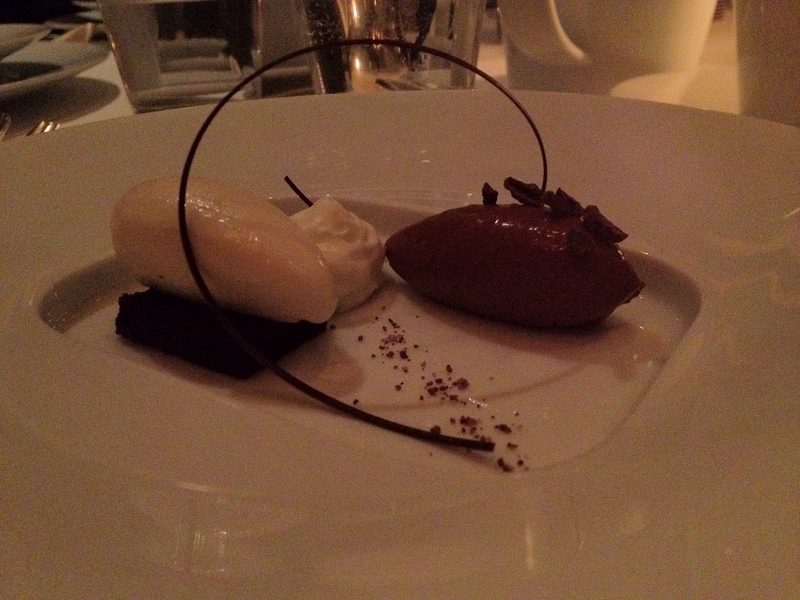 Both were excellent, but the extended tasting menu was just over-the-top. I saw your course with the Wagyu beef, which I assume is generally a supplement. Normally, they have Snake River Farms beef (if I recall correctly), which is decadent as well. I’ve done a 20-course tasting and a 30-course tasting, both for lunch. I think that you see a lot more creativity in dishes for extended tastings, especially because you have more canapés and so on. They actually give out a few extra freebies (3 to 5 courses) to regulars, so most of my meals are about 12 to 14 courses now. I should probably try an extended tasting at dinner for once, but I just haven’t gotten around to it! They’ll usually have Wagyu as a supplement for the main beef/lamb entrée for dinner. It’ll be around… $75 to 150, I think, for the Wagyu. (Sorry for the huge range; I don’t quite remember at the moment!) I haven’t seen a Wagyu supplement for lunch yet, and so far I’ve only seen a lack of a Wagyu supplement once while at dinner. Then again, I’ve only gone for dinner about 4 or 5 times (considerably fewer times than I have gone for lunch). 30 courses is ridiculous! I think I had around 20-22 with the extended menu at TFL. I agree with the creativity with splurging for the extended menu. 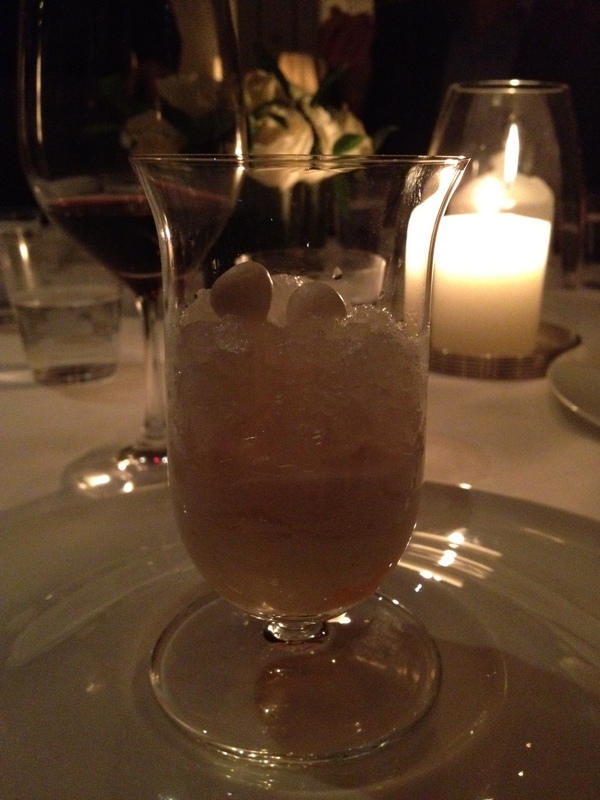 The general tasting menu is generally the same format each day – either at Per Se or TFL. Yea, I think the Wagyu is around $100 supplement when I checked this past weekend (I got curious from this thread – ha!). I know some people have issues with Cesar Ramirez, but I think Brooklyn Fare holds its own (or more, depending on the person) with canapés compared to that with Thomas Keller restaurants. I would imagine lunch is phenomenal – have only done dinners. More leisurely on a Friday or weekend, more sunlight overlooking beautiful Central Park. My next visit (whatever year it is) will be for lunch and the extended tasting menu, along with requesting the pressed duck!